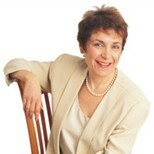 Caroline Myss, Ph.D., is a sought-after speaker on spirituality and personal power. She is recognized for her work in teaching intuitive diagnosis and is a pioneer in the field of energy medicine. Raised Catholic in the Chicago area, she graduated from St. Mary of the Woods College in Indiana and then pursued a career in journalism. As a freelance writer, Dr. Myss attended a seminar of Elisabeth Kubler-Ross and was thrown into a “crisis of meaning.” This inspired her to attend Munde-lein College and receive her master’s degree in theology. Dr. Myss started the Stillpoint Publishing Company in New Hampshire, where, for the first time, she acknowledged her medical intuitive abilities. Dr. Myss began working with holistic doctors and co-wrote the book, The Creation of Health, with C. Norman Shealy, M.D. She also started creating audiotapes and lecturing around the world. In 1996, her book, Anatomy of the Spirit was published and became a New York Times bestseller. She has written other bestsellers since. Caroline Myss has appeared on The Oprah Winfrey Show and was formerly a columnist at New Age Journal and Healthy Living Magazine. She had a show on the Oxygen Network called The Journey with Caroline Myss. She is the founder and director of the Caroline Myss Education Institute and also co-founder and director of The Language of Intuition Program and the Institute for the Science of Medical Intuition. • I firmly believe that intuitive or symbolic sight is not a gift but a skill—a skill based in self-esteem. • By far the strongest poison to the human spirit is the inability to forgive oneself or another person. Forgiveness is no longer an option but a necessity for healing. • Do you really want to look back on your life and see how wonderful it could have been had you not been afraid to live it? • Intuition is neither the ability to engage prophecy nor a means of avoiding financial loss or painful relationships. It is actually the ability to use energy data to make decisions in the immediate moment. • We grow primarily through our challenges, especially those life-changing moments when we begin to recognize aspects of our nature that make us different from the family and culture in which we have been raised. Anatomy of the Spirit was Caroline Myss’s first bestseller, and it is the best place to get started. Her book shows the direct link between our emotional/spiritual stresses and specific illnesses in our bodies. Her system of energy medicine teaches you the specific psychological, physical, and emotional factors that lie at the root of illness. In her book, Dr. Myss presents a complete program for spiritual growth. She says that as you begin to understand the “anatomy of your spirit,” you will not only discover the spiritual causes of illness but also how to sense and correct an energy imbalance before it expresses itself as illness. Anatomy of the Spirit will also show you how to recover, both physically and emotionally, from an illness you may already have. I disappoint some people when I discuss intuition because I firmly believe that intuitive or symbolic sight is not a gift but a skill, a skill based in self-esteem. Developing this skill and a healthy sense of self becomes easier when you can think in the words, concepts, and principles of energy medicine. So as you read this chapter, think of learning to use intuition as learning to interpret the language of energy. Everything that is alive pulsates with energy, and all of this energy contains information. While it is not surprising that practitioners of alternative or complementary medicine accept this concept, even some quantum physicists acknowledge the existence of an electromagnetic field generated by the body’s biological processes. Scientists accept that the human body generates electricity because living tissue generates energy. The best way to get a sense of Caroline’s beliefs is directly from her book. Anatomy of the Spirit is certainly a valuable contribution to the ongoing exploration of spirituality and health.